In 1952, my house was renovated. Under the hardwood floors that were installed then, the previous owners left me a type of time capsule in the form of a few old newspaper clippings. 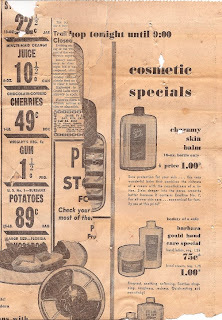 Based on the clippings found, I think they were trying to let me know how much things cost in 1952. I can't figure out what the top item on the left was, but 1lb of Chocolate Covered Cherries now goes for about $20. Which is about 40x the 1952 price. Minute Maid OJ varies depending on if it is on sale, but you can buy it on the internet (seriously) for $4.49 for a 12 oz can. The 10.5 cent can is 6oz, so relatively speaking, OJ is up 21x. Wrigley's gum now goes for about $0.50 a pack instead of 1.5 cents a pack, so 33x the 1952 price. And yummy potatoes... Now let's say they cost an average amount of about $0.50 a pound. This 25 pound bag would go for about $12.50 today. That's a 14x incease over 1952. The interesting thing here is the lotion that costs $1 for a 16oz bottle. I could probably get a cheap bottle of 16oz lotion at the dollar store. 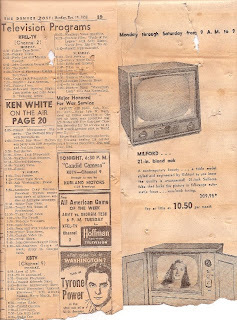 I could also pay about $56 for 16oz of Keils, so anywhere from 1-56x the price of 1952. Who loves their digital TV? I know I do... Can you imagine spending even $309.95 today to watch about 3 channels, each with only a few programs airing? Seems outrageous to me! Considering the typical inflation since 1952 is about 8x, maybe I need to start looking for sale food items to compare with instead of internet prices... But that still means this small, heavy TV would cost $2472 of today's dollars! Any hockey fans out there? 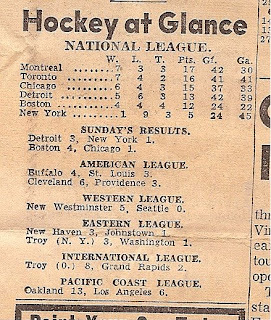 Can you imagine what it would be like to have only 6 teams?!? What, no Avalanche? This little blast from the past sponsored by the past and current owner at 1201 Adams St.